CES has turned into the first car show of the year, with major automakers choosing to show off upcoming features in Las Vegas. Microsoft wants to help make cars more intelligent, and it unveiled a new suite of services Thursday to do so. 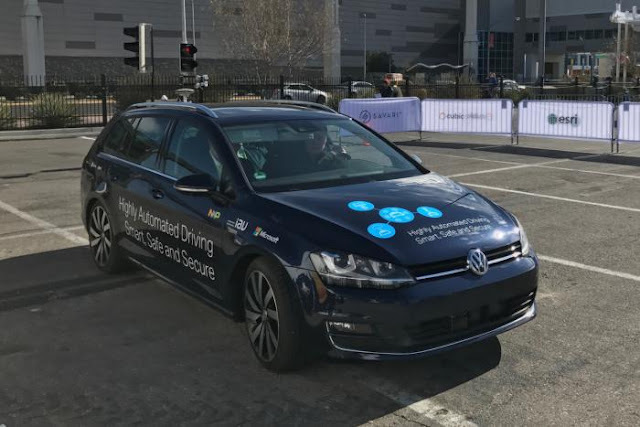 The Connected Vehicle Platform brings together a smorgasbord of services from Microsoft, including Azure IoT Hub, Cortana Intelligence Suite, Microsoft Dynamics and many others. In addition, Office 365, Skype for Business and Cortana can be integrated with the platform. It’s not a surprising move. Microsoft frequently packages cloud services as suites, then markets them for kick-starting particular applications. Furthermore, the company has been saying for some time that its goal in car tech is to support carmakers rather than build its own connected cars. Carmakers can use just certain pieces of Microsoft’s connected car platform, like the Cortana Intelligence Suite and Azure IoT Suite, or adopt the whole thing. The goal is to support Microsoft’s vision of a smart car as a mobile device that helps users to be productive while they’re on the road. From a technical standpoint, users of the platform will use Azure IoT Hub to send messages from a car to the Microsoft cloud, and vice versa. Once companies have car data in Azure, they can process it there using a variety of services. By the same token, integration with Skype for Business can bring Voice over IP (VoIP) into internet-connected cars, and Cortana integration will allow drivers and passengers to interact with Microsoft’s virtual assistant while on the road. Renault Nissan is the first company to adopt the entire platform to power its connected cars. On Thursday, the company announced at its CES press event that it would bring Cortana to its cars as well. The company was already working with Azure, and this commitment expands that work. Microsoft is no newcomer to the car business. It's also a big supplier of technology to manufacturers including Volvo and BMW.